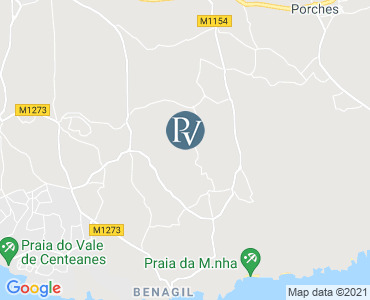 Flor da Lua is a recently renovated 5 bedroom Premier Villa located in the quiet countryside of Val del Rei, near Carvoeiro, part of the west Algarve, Portugal. Flor da Lua sits in a secure private plot, surrounded by pine trees and beautiful countryside. The large swimming pool forms the focal point with a large outdoor dining area including a bread / Pizza oven, along with gas & charcoal BBQ's. The roof terrace with comfy sofas, is the perfect position to enjoy the fantastic sunsets. Inside, Flor da Lua has a comfortable open planned air conditioned throughout, with TV and music system, as well as an additional TV snug with WiFi, DVD, and PlayStation 2. The kitchen is brand new and is equipped with double fridge freezer, dishwasher, electric hob, microwave, oven and washing machine. There are 5 double bedrooms, all with en-suite shower/bathrooms and access to the outside via patio doors. Bedroom 5 - 1 double bed and en suite shower room. The village of Carvoeiro has many shops, restaurants, coffee shops, bars, nightclubs, banks and chemists. Along with the beautiful sandy beaches of Benagil and Marinha are just 5 min drive away. Lagoa is the nearest town with a local fish market and two large supermarkets for all your needs. For a fabulous family day out, visit the historic town of Silves with its ancient Moorish castle, or visit the fantastic water park (Slide and Splash) and theme park (Zoo Marine) all are a short drive away.